I’m here with another installment of our Knitting Basics Series! I enjoy knitting so much but found it frustrating when I was a beginner. Just like any other hobby, it takes time, patience and practice. I’ve enjoyed putting these knitting basics together for you and actually learned some new things myself while working on these tutorials. Of course you know the feeling…you’ve finished a project and the moment has come when you can complete it, admire your work and if you’re like me, start thinking of your next project! This is where your bind-off takes place. After all your hard work you want to make sure to use the right bind-off method for your project, one that feels most comfortable to you. There are different methods for binding-off but I’m going to show you my go-to bind-off method. This is the way I’ve done it for years and have found it to be the easiest. Here’s a great tutorial with a helpful video that should help to alleviate your fear of binding off your work. Click for our complete Knitting Basics series. 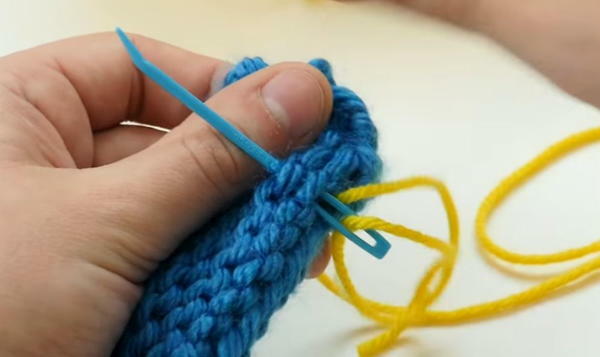 The video below demonstrates the very standard form of bind-off. This method is also sometimes called the stable bind-off. 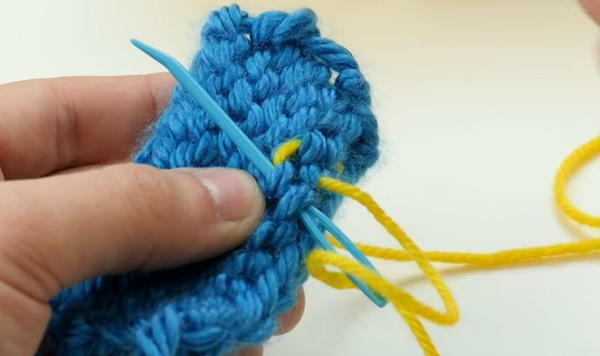 There are other types of bind-offs that create different types of edges, but this one is the most common and most useful type of bind off for beginners to know. All that “binding-off” means is that you're completing your pattern and finishing the last row of stitches by completing them without starting a new row. Insert the needle that’s in your non-dominant hand into the first stitch on the working needle (the stitch on the right) as if to knit. Take that stitch and pass it over the second stitch and off of the needle. Knit the next stitch and repeat from step 1 until you get to your final two stitches. When you have your final two stitches on your working needle, insert your left needle into the first stitch and pass it over the second stitch, just like you've been doing for the other stitches in your bind off. With the one remaining stitch on your needle, take a pair of scissors and cut your working yarn so that you have a 3-4 inch tail. Using your needle, simply pull the needle up and bring the yarn through the center of your final stitch. Tighten the yarn, and you're done! Now that you've got your yarn off of your stitches, you've probably noticed that you have two strands of yarn, dangling from the ends of your fabric. Your instinct might be to just cut them off, but don't do that. That will make your yarn unravel, and your project will fall apart. Instead, you want to weave your ends into your knitting in a way that secures them in place! Thread your end through the eye of your tapestry needle. Insert the tapestry needle into one of the holes in your bind off row. Note: Make sure you do not thread your end through the stitch it's coming out of. This will undo the stitch. Identify the "smiley faces" or "frowny faces" in your work. Bring the yarn up and through one of the frowny faces. Angle the needle up and slightly to the left so that the needle is going through both the frowny face and the smiley face above it. Bring your tapestry needle down through the smiley face to the left of the previous smiley face that you just came out of. Angle the needle down and to the right to go through the frowny face below it. Move the tapestry needle to the next frowny face to the left and bring the yarn back through the smiley face that you just came out of. You'll be going through each of these loops twice as you weave in your ends. Repeat this, going up and down through the stitches. You should have at last two inches or so of your ends weaves in to keep them secure. Then you can cut the end close to the fabric. The tip of the yarn will "felt" into the fabric over time. Special thanks to All Free Knitting for allowing us to share their great tutorial with our readers! Use your scrap yarn stash to create a lovely knitted throw or shawl with tassels using this free pattern. Cabled Twist hand-knitted socks are darn cute & an easy project for an experienced knitter.